To start off, I just wanted to point out that, for my own reasons, I like the paperback book cover more than the Kindle version book cover featured above. The image of a house on what looks like rocky cliffs, on a background of mist and darkness gives a much better sense of a Gothic, ghostly setting than the one of a woman's silhouette walking amidst a vague background that might be grasslands and clouds. 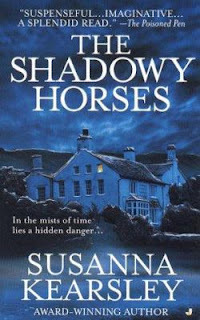 The Shadowy Horses was a very interesting and great read. It is written well, and the imagery Kearsley creates with her vivid descriptions are pretty wonderful. They make you feel like you're right there with Verity, walking the fishing docks and the museum, or rushing through the rainy moors, or looking out her bedroom window in the middle of the night, listening to the sound of galloping hooves. This book is extremely well written. It also helps that the story has a very attractive premise that caught my attention immediately. I've always been interested in archaeology, historical locales, creepy old mansions, and ghostly happenings (as much as I don't like horror). Put all of this together, with a wandering ghostly Sentinel, and shadowy horses, with an ominous legend, that gallop in the middle of the night, and you've got really well outlined Ani-bait. The characters weren't too shabby either, each exhibiting their own unique personalities. I tried really hard to imagine all the different accents, with all of our main characters prominently English, Scottish, and Irish--this would probably a great book to listen to in audio given the perfect narrator. And it looks like I learned a little bit of Scots as well, and am interested in picking up my own Scots dictionary. 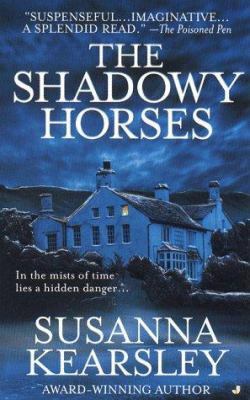 The Shadowy Horses is also chock full of little history lessons, and a couple of mythical legends that I loved! It certainly added onto the atmosphere. Story-wise, however, I couldn't help but notice that, to be honest, a whole lot of nothing happens in this book. There is a lot of day-to-day banality that seemed to drag on as we awaited each dig day to find something, rolled over into the night to hear the shadowy horses, then went into town for personal reasons. The ghostly haunting by the lone, wandering Sentinel isn't as creepily bone-chilling as I'd expected--the purpose for his presence was fairly predictable, and it doesn't take a five-year-old psychic to tell you as much. The first introduction of the shadowy horses had promise, but I kept feeling like there should have been more to it than just hearing them galloping each night. There was very little build up to the main conflict of the book, which is evident when the conflict pops up at the end and I didn't even realize there was such a serious conflict to begin with. And the fact that when the conflict DOES come up, there was no question about how everything would resolve; no surprise twists or anything presented. All-in-all, I suppose I was kind of expecting a bit more, probably because of the strong start the book gives us. To be fair, this isn't Susanna Kearsley's most popular work, and I think is one of her first few books written. It's just the first one that caught my attention, both with the premise and the paperback cover of the creepy looking mansion (see above). I wouldn't mind continuing to explore more work by Kearsley in the near future, if anyone's got some recommendations, though; because I most definitely will keep her on my radar. 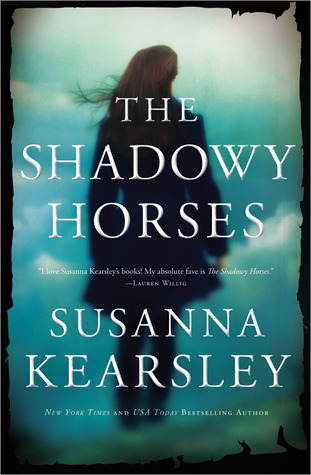 Overall, The Shadowy Horses was a quite sort of entertainment, and I enjoyed myself, even if I felt like something was missing from this novel. 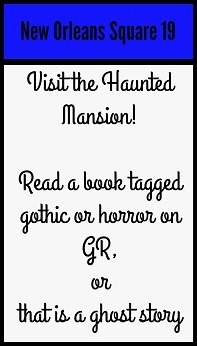 Book is tagged 'gothic' on GR; summary includes mentions of ghostly sightings.